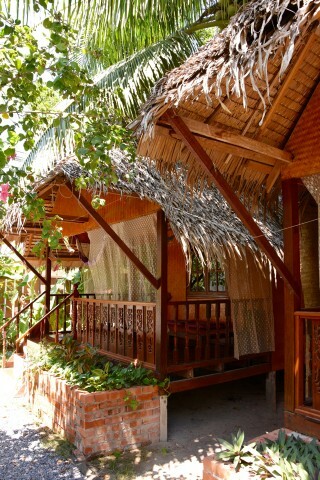 Koh Lipe Homestay’s charming wooden bungalows sharing land with Keirita’s Yoga represent excellent value for air-con. Located around the corner from the eastern end of Walking Street and a five-minute walk from Sunrise Beach, the Homestay offers a handful of clean bungalows with large porches and high thatch roofs stacked close together across from the yoga studio. Average rating 8.7 from 180 reviews. Inside they feature decent queen beds, cushioned futons by the windows and spacious bathrooms with hot-water showers behind curtains. You also get hardwood floors and bright sea gipsy paintings on woven bamboo walls -- these rooms really have a personal touch. Free WiFi, breakfast and a shared kitchen are available, but this is a small place and we had to swing by a few times before we could track down the staff. They were sweet and offered to show us a room before we asked, but do call them ahead of time to inquire, as the rooms are often full. Fronting the bungalows is a tiny lawn and kitchen; the pizza oven with dolphin paintings is from the property’s previous incarnation as an Italian restaurant and is no longer used. The Homestay is an obvious choice if you’re doing yoga with Keira, but the rooms are managed separately and you don’t have to be a yogi to stay here.